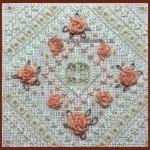 Design is called Peaches and Cream, design area: 60 stitches x 60 stitches, worked on 25ct Antique White Dublin Linen. Finished worked area is about 4.75 inches square. 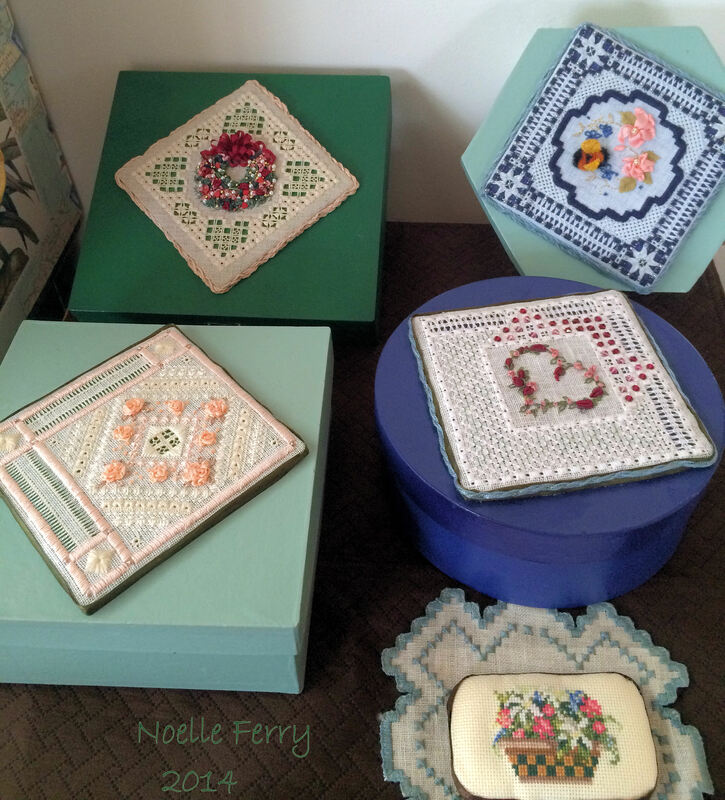 This has been quite an enjoyable design to work and I especially have enjoyed using the Trebizond threads. 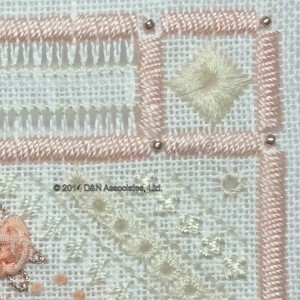 The threads are: Trebizond silk, Broider Wul, Kreinik Blending Filament and DMC Ivory color Pearl Cotton, YLI silk ribbon and beads. Below photo shows completion of my cyberclass lessons for week two (out of three weeks). 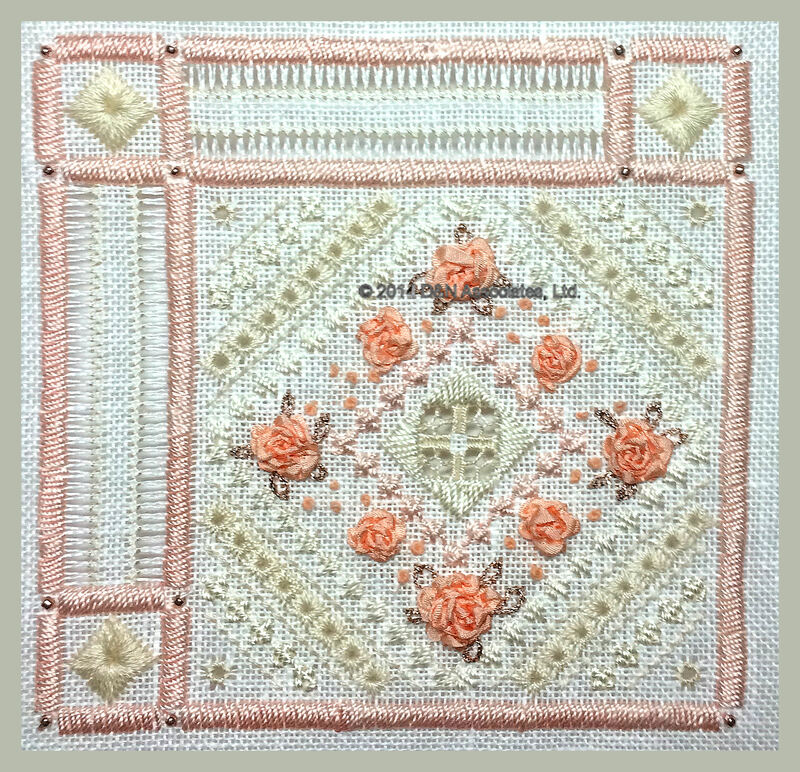 I ran out of the Trebizond light peach sorbet color silk thread. That color has been discontinued but I was lucky to find a spool of it on the Rainbow Gallery website. 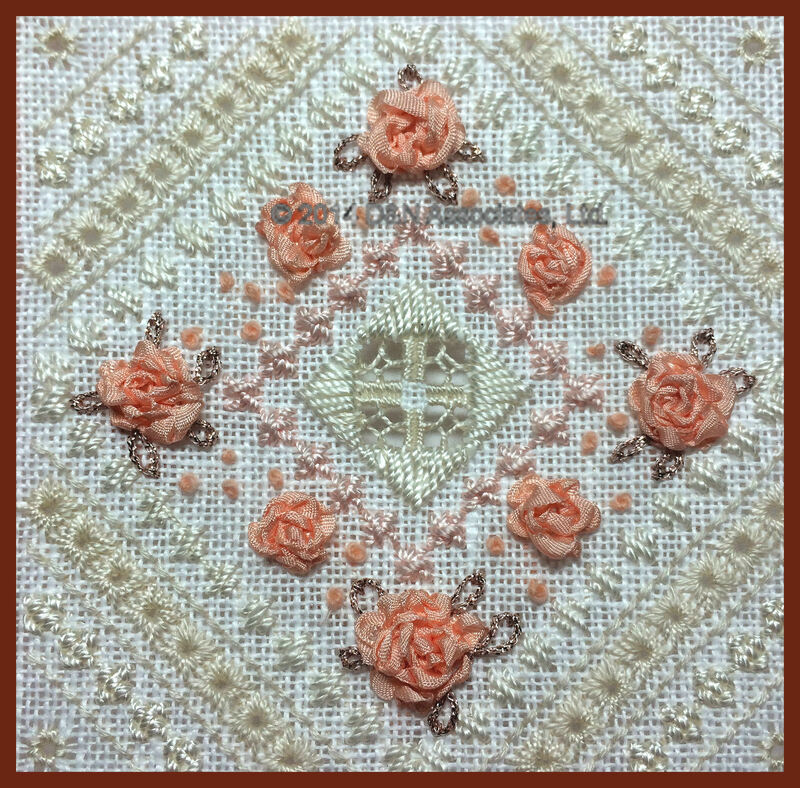 The lessons for week three will included the silk roses that will be stitched into the center area, the hem stitching within the two long pulled areas and the three corner Rhode stitches. For the Rhode stitches I used three strands of DMC floss, color 712 (cream). 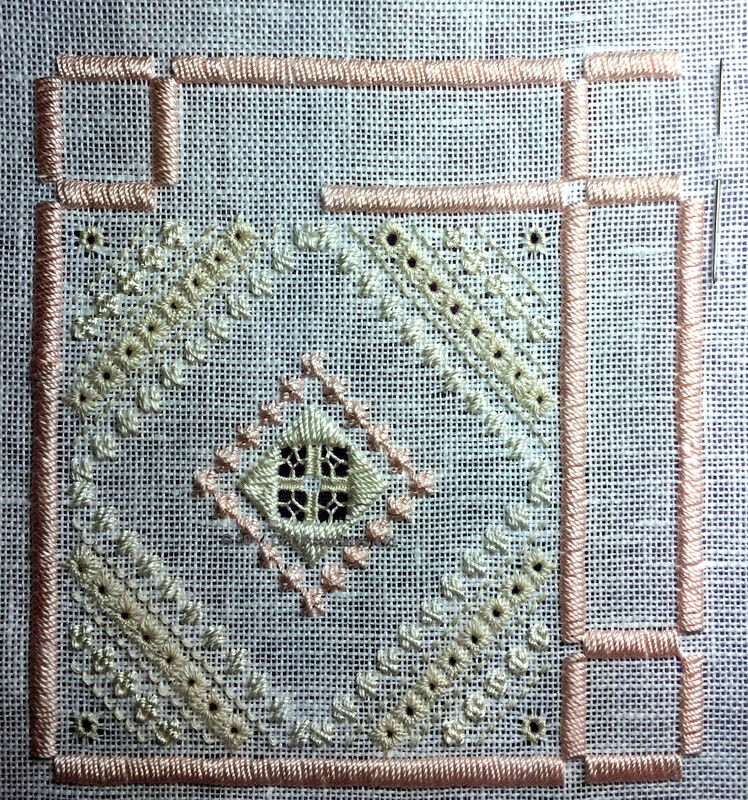 I separated and finger combed the three strands then used a laying tool as I did each of the three Rhodes stitches. I think this combing and use of the laying tool produced very nice looking Rhodes stitches. 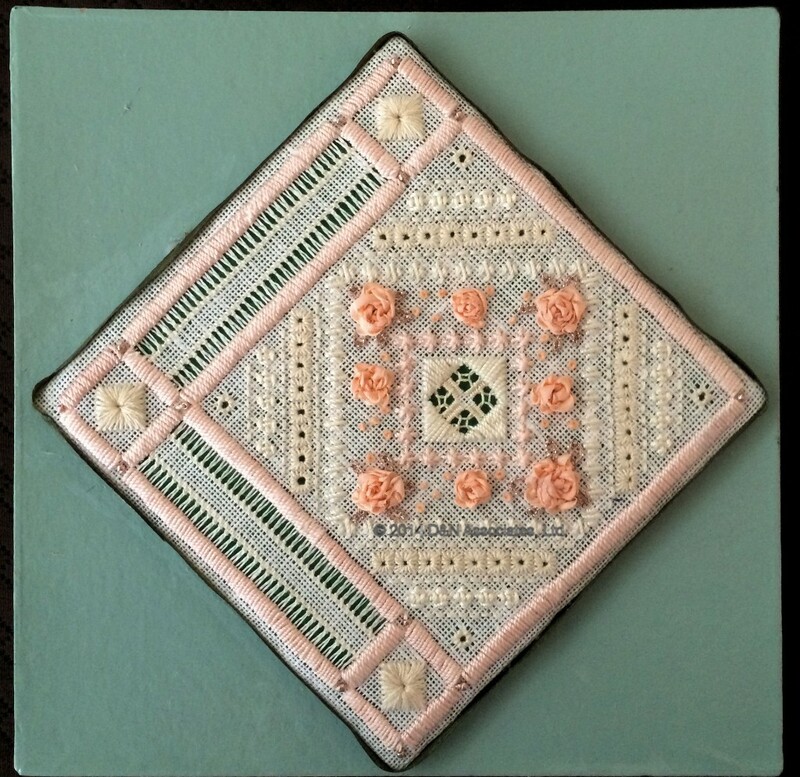 Below photo shows finished piece adhered to lid of a 7-inch paper mache 7 x 3 inch deep square shaped box. I purchased this unfinished paper mache box at a local Michael’s craft store then spray painted the box using a soft green gloss paint. 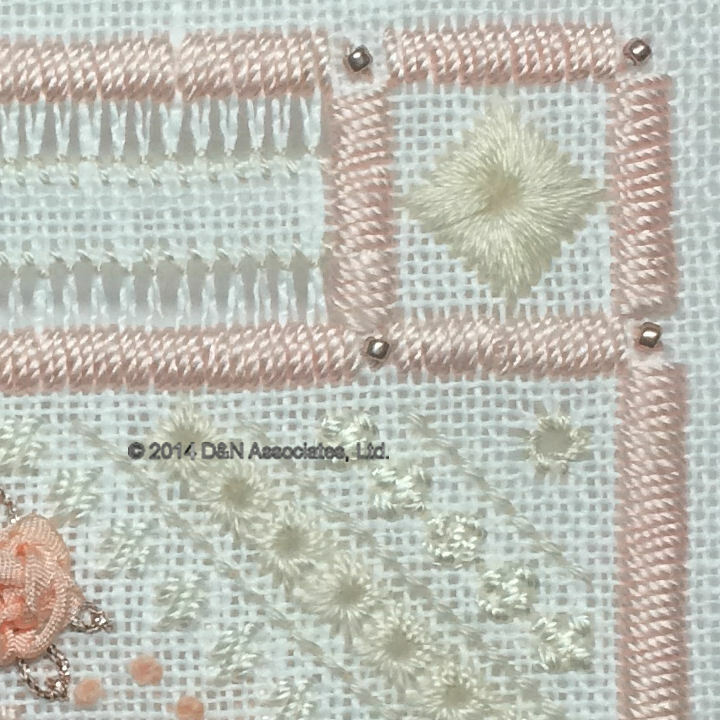 The finished stitched piece was adhered to a quarter inch thick mat board with dress maker pins along the raw edge of the mat board. I glued an olive green satin ribbon around the raw edge of the mat board then I glued the mat board onto the top of the box lid.